The Walking Liberty design of Augustus Saint-Gaudens was the first design created in response to a commission by President Theodore Roosevelt for new, more artistic U.S. coins. Today, millions will instantly recognize this classic design. Relatively few, however, are aware of the “lost” Winged Liberty design which Saint-Gaudens originally envisioned. The two men met in 1905, when Teddy Roosevelt chose Saint-Gaudens to design an inaugural medal for his second term as president. The Irish-born Saint-Gaudens was America’s foremost sculptor at the time – although his best-known works were massive bronze sculptures such as the statue of Admiral David Farragut, a Civil War naval hero which still stands in New York City’s Madison Square. Roosevelt was delighted with the medal design Saint-Gaudens created for him and the men began to share how much they both admired the high-relief coins of ancient Greece. Both men felt that the current U.S. coin designs of the day were uninspired and derivative and Roosevelt soon commissioned Saint-Gaudens to craft a complete series of U.S. coin designs based on those classical Greek models. When he accepted Teddy Roosevelt’s challenge in 1905, Saint-Gaudens was 56 and his health was beginning to decline. He was still at the peak of his artistic powers, however, and he eagerly accepted the challenge to help the president realize his dream. From the start, Saint-Gaudens’ intention was to totally redesign U.S. coinage in a bold and artistic manner. While the resulting Saint-Gaudens Walking Liberty design is one of the most beautiful and best known in history, an early plaster sketch sculpted by the artist in 1907 shows two dramatically-different elements. This design (sketch shown right), a precursor to the finished version, shows Liberty as she would ultimately appear on the 1907 Gold Double Eagle, except that she was portrayed with large, billowing wings and with a feathered headdress. Until recently this plaster sketch was “lost” within Saint-Gaudens’ studio archives and few were aware of its existence. Finally, it was re-discovered when his New Hampshire studio was made a National Historic Site & opened to the public. While this beautiful design was never actually struck as a U.S. coin, the original plaster has been officially authenticated by the Numismatic Guaranty Corporation (NGC), one of the premiere coin grading services in the world. 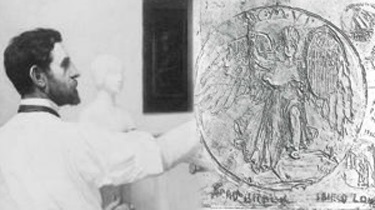 Shown left is a modern sculpted plaster interpretation of what Saint-Gaudens' Winged Liberty design could look like as a coin. 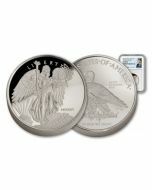 Add this lost masterpiece to your collection today, with GovMint’s exclusive Winged Liberty Commemoratives!